Those of us who work in regulated industries, such as banking institutions and credit unions, often succumb to the temptation to see government regulators as adversaries and to view any restrictions they impose as unreasonable curbs on free enterprise. Increasingly, this anti-regulation chorus in the financial services industry, coupled with the virulent anti-government sentiment sweeping into Washington, has painted a huge target on the back of the Consumer Financial Protection Bureau (CFPB). Policymakers and the voting public don’t need a long memory to understand the danger in undermining one of the most effective pro-consumer federal actions in our nation’s history. The 2008 housing crisis made clear that giving banks free reign to put profit before the interests of American consumers places the entire economy at risk. Before the CFPB, lightly regulated banks did sloppy underwriting, tricked consumers, and took unconscionable risks in investment markets. This crisis cost American households on average about 40 percent of their net worth, according to data analyzed by the Pew Research Center. Banks struggled in the crisis too, of course, but the financial service industry’s recovery has been nothing short of remarkable. The rebound is even more striking when compared to other sectors of the economy, and to American consumers. According to an American University analysis of FDIC data, 2,350 banks and savings institutions closed up shop between 2007 and 2015, but the wealth at the top of the banking sector remained almost unchanged. “Banks now have more assets, capital, deposits, profits, [and] reserves, and fewer losses and troubled assets than they did in 2007,” the report notes. In contrast, median wealth for American families is still far less than pre-recession levels and the recession’s negative impact on net worth was worse for African-American and Hispanic households, the Pew Research shows. So, in this arena where the interests of struggling consumers are pitted against banks that boast assets measured in the trillions, I contend that all consumers—and those who champion them—must fight for the continuation of a strong, independent Consumer Financial Protection Bureau to ensure a fair and equitable financial marketplace. 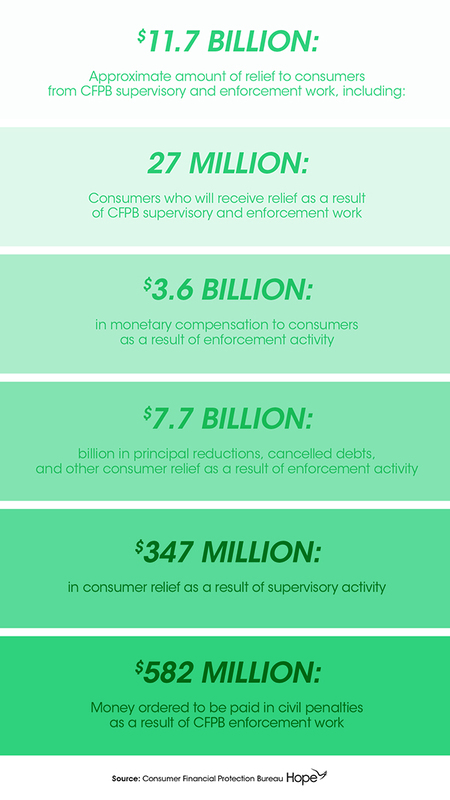 Since opening its doors in 2011, the CFPB has returned nearly $12 billion to the hands of 27 million consumers who had been wronged in financial dealings. 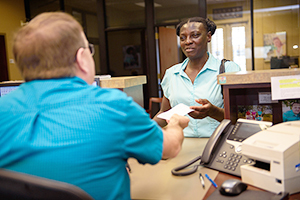 At Hope Credit Union, the CFPB’s rules and regulations present no conflict with our mission. In fact, it is exactly our mission, as it should be for all banks and credit unions that rely on federal insurance to borrow money from consumers in the form of deposits. In exchange for this privilege, we are required to make loans and otherwise manage these funds in a responsible manner that serves the public interest. When consumers have access to fair-priced loans and honest treatment in everyday transactions that improve their financial position and strengthens the economy, everyone wins. In addition to ensuring the responsible behavior of depository institutions, the CFPB works to curb abusive practices by payday lenders, check cashers, debt collectors, and other financial operators who prey on vulnerable consumers. Also of critical importance is CFPB’s work to empower consumers to make informed financial decisions by providing them with tools and information. This helps families better manage things like student loan debt, which has quadrupled over the last decade for older Americans, becoming the second largest item on a family’s balance sheet, after a home mortgage. Is it unreasonable to require that lenders tell potential customers the truth about costs and risks associated with taking on debt, whether in the form of a mortgage, student loan, auto loan, or other consumer loan? Or to require that lenders face consequences for fraud and discrimination? Belief in fundamental fairness cuts across all political ideologies, and receives support from Evangelical Christians and old-line Civil Rights organizations alike. A case in point is a recent citizen-sponsored initiative capping small-dollar loan rates at 36 percent that passed overwhelmingly in South Dakota, making it the 15th state to restrict these rates. Financial industry leaders would do well to take note of this trend. Likewise for members of Congress. Despite campaign contributions from the financial industry and impassioned pleas from their lobbyists, their constituents are American consumers. Like South Dakota, all Americans should demand that Congress and the president preserve a strong, independent CFPB. By acting on the side of every single American consumer to make financial markets fair for everyone, it serves as a shining example of government for the people. Rich Cordray and the CFPB team have done an incredible job of implementing fairness in banking processes/procedures, protecting the consumer, and educating consumers to know before they owe. If you wanted an example of a regulatory agency that was of the people, for the people, CFPB would be it. Don’t let greed and unscrupulousness over-rule good government.